Former prime minister Tony Blair played matchmaker with the Chinese dictatorship for Saudi royalty's oil concerns. According to a Guardian exposé, the blood-soaked Middle East 'peace envoy' earned £41,000 a month plus commission from the arrangement. There was some suggestion this could have been against financial regulations. According to the arcane rules of high finance, Blair is not "authorised" to broker deals, but only to "open doors". In the end, the Financial Services Authority found no evidence of wrongdoing. Legal or no, the figurehead of Labour's Toryisation made more per month from it than most workers do per year. 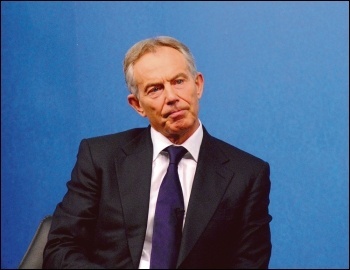 And legal or no, Blair's wars in the Middle East laid the groundwork for his influence with oil producers.